For the sixth time, the cabinets from Berlin and Jerusalem had the opportunity to discuss a range of issues during German-Israeli government consultations. The big elephant in the room, Iran, was one of the most important subjects, yet again. 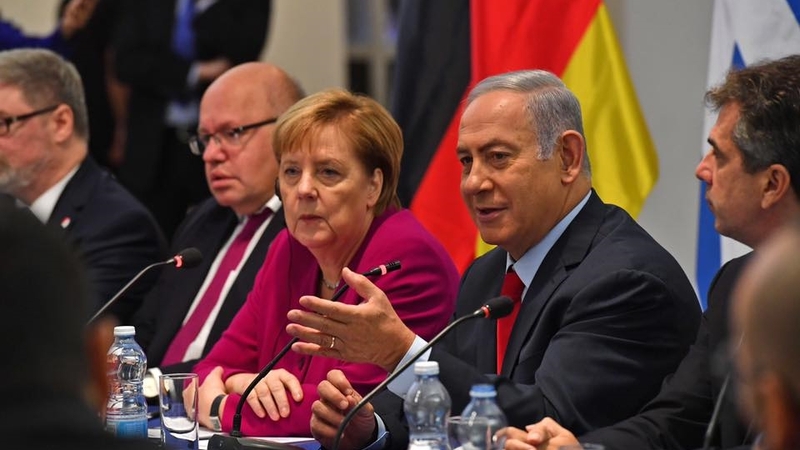 Everything possible had to be done to make sure Iran would not have nuclear weapons, German Chancellor Angela Merkel said during her government’s visit to Israel. “We do not always agree on the path to go”, she stated. While Merkel believes in the so-called Iran Deal, along with most of the E.U., Israel does not. “The threat (originating from Tehran) is spreading from Iran into Europe”, Israel’s Prime Minister Benjamin Netanyahu insisted. According to him, the Iran Deal, which the U.S. government recently pulled out of, but which Europe wants to stick to anyway, floods Iran’s pockets with billions of Dollars, while the Tehran regime spreads terrorism. Among high-ranking politicians in Germany, Angela Merkel is one of the most pro-Israeli ones. In 2008, she declared that “the historic responsibility for Israel” was Germany’s “public policy”. Today Merkel said Israel had the right to defend herself when attacked. Many European politicians would prolong that sentence by adding “but” with a sequence of words which relativize the first part. The difference is that Merkel does not. But, as pro-Israeli or realistic as she might be, Merkel still defends the Deal. Critical observers say the agreement strengthens a regime which keeps on threatening to “annihilate Israel”. They also believe it does not make nuclear inspections in Iran easy or effective at all. This big difference of opinion between Berlin and Jerusalem became evident yet again, during the consultations in Israel. Also regarding the U.N. agency UNRWA, Berlin actually works against Israel, critics say. UNRWA is responsible for people it calls refugees, not globally like the UNHCR, but for Palestinians only. When the Americans recently cancelled their support for UNRWA, they had reasons. In 1948, seven Arab states told the Arabs in Israel (who call themselves Palestinians today), they should get out of there, just before their armies attacked the newly founded country, intending to wipe it off the map. The Arabs were told they would be allowed to return afterwards. Since Israel fought off the attackers, they never returned. There were 500,000 Arabs who did leave, hoping to be back home after a week. Other Arabs, 160,000 of them, stayed in Israel, where 20 percent of all inhabitants are Arabs today. The fact that even more Jews were expelled from Arab states, around 850,000 of them, all of whom were accommodated by Israel, while the 500,000 Arabs were not accepted into any country, shows how the refugee problem was constructed intentionally. UNRWA counts those 500,000 original refugees along with all of their descendants. That is how they get to 4.7 million Palestinian refugees. Even today, neither UNRWA nor most Arab states seem to want to solve the refugee problem, e.g. by accepting Palestinian refugees into those countries, since they would rather continue blaming Israel for the situation they themselves created. In 1952, the head of UNRWA, Sir Alexander Galloway, said something which in the eyes of Israel and others still applies today: “The Arab nations do not want to solve the Arab refugee problem. They want to keep it as an open sore, as a weapon against Israel.” Today, critics say UNRWA is helping those same states to prolong the problem, instead of resolving it. In spite of all of the above, Angela Merkel’s government still intends to support UNRWA even more, since the Americans pulled out. Israel’s attempts to explain things to the Germans, in this regard, have failed so far. It remains to be seen whether they can make it stick during these latest consultations. Another subject of the discussions was antisemitism in Germany. The Israeli hosts asked their German guests about the situation they are very concerned about. Chancellor Merkel conceded there was still antisemitism in Germany, and she said it was spreading. Felix Klein, Germany’s new coordinator against antisemitism, was part of Merkel’s delegation. Regarding the Israeli-Palestinian conflict, Merkel said she believed a two-state solution was the best path to peace. This is exactly what Netanyahu’s government says. But as it turns out, Hamas does not only reject negotiations, but also peace. The Palestinian Authority (PA) does not want negotiations either, which is why there are none. Merkel did not mention the refusal of the Palestinian leaders to enter peace negotiations, or their rejection of every single peace accord discussed in the past seven decades, but she did criticize “the settlements”, saying the construction aggravated a two-state solution. European heads of governments usually say so when they visit Israel. But the German-Israeli government consultations were about more than Iran, UNRWA and the conflict. All ministers spoke to their counterparts about deepening the cooperation between the two countries in many ways. Merkel said the relations between Israel and Germany were “very intensive in many areas.” This included the economy, IT and cyber security cooperation, research and development aid in Africa. Netanyahu said the cooperation between Israel and Germany in the specific area of technology had marked the visit. This was the key to the future. In Israel, Angela Merkel also got her 15th honorary doctorate. The University of Haifa awarded it to her.